At the young age of 5 years, sweet Voodoo was turned in to a shelter because his family had no time for him. His previous family reported that they kept him as an outside dog. They also reported that he was good with kids and a nice dog. He did prove to be a very nice dog, despite all the physical ailments he arrived in foster care withconjunctivitis, a possible minor bladder infection, a mild case of eczema, a hypothyroid condition, Lyme disease, and Demodectic mange. With the tireless and attentive help of his dedicated foster parents, Voodoo beat the odds with a smile and overcame all of his ailments. Voodoo, along with Umali whom you will read about shortly, found his forever home with the Pittmans on January 10, 2004. Umali requested permission to come aboard the TOTT foster family from Red Lion, PA, where she was found as a stray. She was just too sweet to stay at the shelter for any longer, so she was beamed to Philadelphia, where she lived for a time with her foster family. 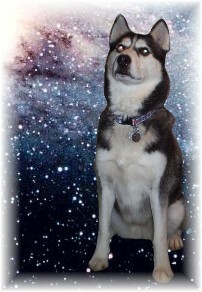 She was named Kida at the shelter, but since she didn't seem to know her name, we gave her a TOTT name. 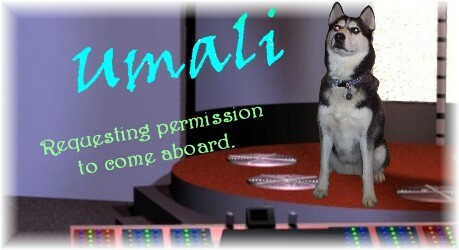 Following our current theme of Star Trek, she was named Umali, who was a character from the Voyager series. Umali (Molly for short) is very sweet. She just loves to spend time with her people. She is content to lay at your feet and be close to you. She does very well with other dogs and shares her toys and treats nicely. She has been to the dog park and played with dogs of all sizes. She tends to be a loud player, voicing her enthusiasm as she wrestles. She did however take play breaks to give kisses to the humans in the park. She is very good with kids, and gentle. We took them to PetsMart and they were both very well behaved with the pets and the humans. We got them crates and set them up. Molly and Voodoo are getting better at tolerating each other. There have been jealous and posessive moments, but they are adjusting. eventually got in. Molly settled down for the night and spent the night with us in bed. Voodoo started with us but went into this crate by himself and stayed there for the balance of the night with the crate door open. No problems. been a sweet, lovable guy. her in. She likes to sit at the patio door and look out. Voodoo and Molly are doing wonderfully! Molly has attached to Lee, and Voodoo is hanging with Jean. They're getting along very well together. Lee didn't have enough good to say about them (and TOTT). He said he's learned so much from us and that we were right about the right dogs for them and for each other. Molly is apparently the boss dog (because she was low man on the totem pole at her foster home) and she's probably enjoying that! We are adjusting quite well and Molly knows she is boss, Vookie is No.2 and does not mind. 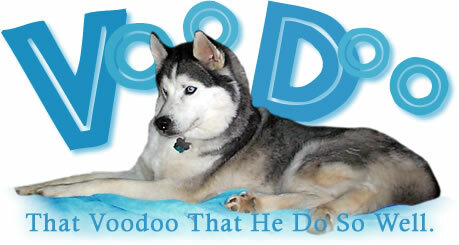 We have made a slight name change from Voodoo to VOOKIE Pittman. Both have their new licences and beauty parlor appointments and we will be taking them to see our vet for a followup visit very shortly. Jean and I are very happy with our new son and daughter and are forming a good family after each day of learning to live with the four of us and seeing what each of us needs. Thank all of you for the opportunity for the opportunity to adopt these dogs!